Because of the health concerns associated with exposing your skin directly to the ultraviolet rays of the sun, many people are opting for a simpler, safer, and less time-consuming alternative of visiting a tanning salon to get their sun-kissed look. Today’s salon visitors can choose from various levels of treatments using modern tanning beds or go for a sprayed-on tan to give color and radiance to their skin. Choose from any of the 10 best tanning salons in West Virginia for that summertime look any time of the year. Since opening in 2006, Sun Time Tanning in Charleston, West Virginia, has consistently earned the reputation of being a salon that’s clean and has a friendly staff. Equipped with the best equipment, this locally owned establishment has four levels of tan that doesn’t leave your skin feeling dried out and gives a beautiful dark tan that lasts for weeks. 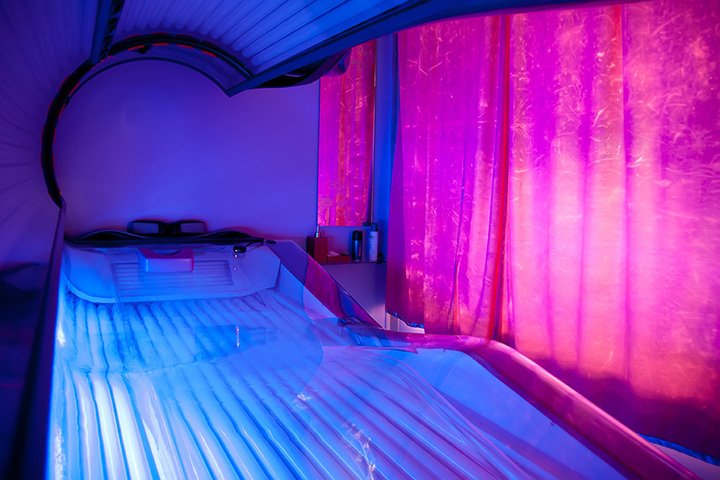 With several locations to choose, you can get your tan on this summer by a variety of beds and techniques that will pamper your skin and give you a beautiful lasting tan. Electric Beach in Charleston, West Virginia, offers five levels of tanning beds and a spray on, sunless tan. Join the salon and receive special discounts and offers like free service upgrades, t-shirts, and other goodies. You’ll feel right at home at Sun Kissed Tanning Salon in Clarksburg, West Virginia. Comfortable tanning beds and friendly attendants are there to help you select the best tanning package for you and make your experience all you wanted it to be. They offer a variety of skincare products that will help keep your skin looking healthy and beautiful all year round. Are you tired of pale skin? Would you like to look like you live at the beach without all the hassle? Then visit Lion in the Sun Tanning Salon in Fairmont, West Virginia. You can choose your level of tan using state-of-the-art equipment and with help from the friendly and knowledgeable staff. You can also choose from a variety of sunless spray tans to look and feel radiant without all the stress and mess. Visitors enjoy discounts on Fridays and you can choose to have other services, like teeth whitening and professional makeup applications. If you live in or are planning a visit to Huntington, West Virginia, stop by Sun Time Tanning Hair & Nail Salon. Don’t let the small outside fool you because it’s bigger than it looks. You’ll get fast, friendly service here without all the hassles of bigger salons. The equipment is clean and new and they have plenty of beds. And best of all, your first visit is free! As soon as you walk in the door of Tiki Hut Tanning & Salon in Milton, West Virginia, you’ll be greeted by a friendly staffer who will make you feel at home. This upscale tanning salon is brand new and takes walk-ins as well as scheduled tanning appointments. They offer four levels of tanning and the VersaSpa Spray tan for those who prefer that method of getting their sun on. What could be better than the aroma of freshly brewed coffee and the look of a sun-kissed body? If you visit Coffee & Tanning in Morgantown, West Virginia, you can experience both at the same place and with a 100 percent satisfaction guarantee. Friendly, certified tanning consultants will welcome you and walk you through the level of service that’s right for you, then help you prepare and get the most out of your tan. Check their website for special offers and promotions. Open year round and with a variety of packages designed to fit any need, Sunny Delight Tanning Salon in Lewisburg, West Virginia, has earned the praises of patrons on several social media sites. This little salon has friendly and professional service with options for full body or leg-only tanning available. You can also choose to tan lying down or standing. Walk-ins are always welcome, but allow at least 30 minutes to get a full tanning experience. Open six days a week, Silver Scissors Family Hair & SunScape Tanning in Reedsville, West Virginia is your one stop place for hair and nail services and tanning that will give you that fresh just-off-the-beach look. Service is fast and reliable and everything is clean. Island Tan in Weirton, West Virginia, offers a clean and well-maintained location with three levels of tanning available and friendly service. The staff works hard to make your experience pleasant and has flexible hours to accommodate busy schedules. They also offer good discounts and specials.